5 miles this morning. What glorious December temperatures for a run in Michigan. Temps in the 60's today - wow! Felt good for this run. A good sign that things will progress into marathon training well. 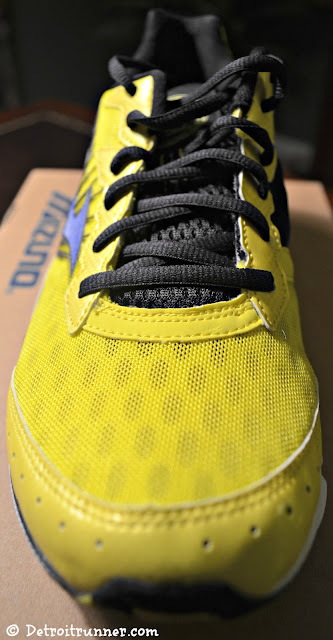 With all my shoe reviews, I try to get in more than just one run and give a complete review. While I can pretty much know very quickly whether it's something that works for me or not, I like to give every shoe the benefit of the doubt and run numerous times in them for both short and long runs. I"m sure you will agree that running 3 miles in shoes is completely different when running 10+ miles in them. Of course, because I've run in the older version, I was pretty confident in the 16's. My first run was 5 miles in them and all I can say is that they are shoe heaven for me. I absolutely love them. Of course, I wanted to make sure that they were equally as good on the long run as well before coming to that conclusion. Since this first run, I have run in them numerous times including a long run and I still feel the same way about them. Wide toe box - I like that my toes can move around and don't feel all crushed together. Our toes were made to move and Mizuno clearly knows this and made for a great feel here. Comfortable upper - I love the Wave Rider because as the upper goes around your foot, it has that perfect fit. Not too tight and not too loose. Heel - the heel stays in place. I hate when you try on shoes and no matter how tight you make them, the heel still slips out. The Wave Riders are perfect here as well. My heel stays in place when I run and I don't have to have a death grip on my laces to make it comfortable. 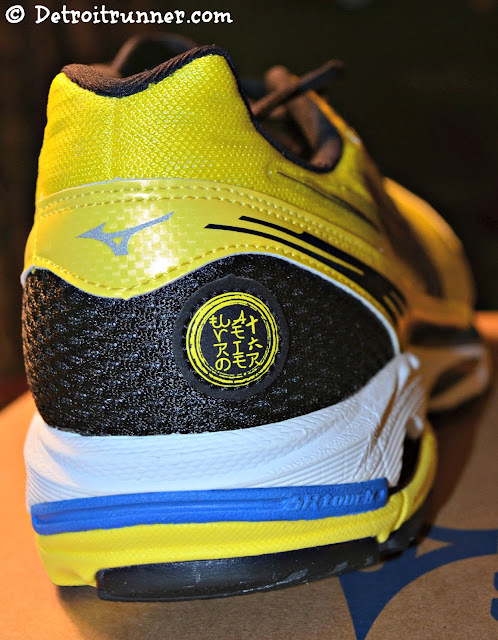 This year Mizuno updated primarily the upper on the shoe to help reduce the weight of the shoes by about 1 ounce. You can tell the difference in the weight and I feel that the upper is even more comfortable now. I will say that one thing it does do is let more air into your shoes. While this is great during warmer months, I could tell the difference almost immediately during my cold weather runs. Not so much that I won't wear them, but the difference was noticeable. The shoes have a 12mm drop so some of you minimalist runners might not like that but I seem to do well in a traditional drop shoes(especially for marathon training) even though I've run in several lower drop shoes. I also had a chance to test these out on the trails even though they are made for roads and they performed equally well. Please keep in mind though, that the trails I typically run are flat rail to trail, crushed limestone and are not technical trails. You would be better served with trails shoes if that's the kind of trails you run. In regards to sizing, they are true to size. I've worn an 8.5 size shoe for all my running shoes and this is a good fit as well. Just a little room in the front make these a perfect fit. Also, I use these as daily trainer shoes meaning that I wear them for everyday training and I also race in them. They are great for both and the cushioning is there for long distances. While it's secondary to the decision making process(or sometimes first for women), the color/style is awesome. Actually, I like some of the women's colors as well and wish Mizuno had them in men's too. On Saturday's run, I ran in all black clothes with these shoes. They stand out like crazy! I love that about a shoe. These are not shoes I'd be wearing for everyday wear(even though they are comfortable enough for it) as I use them solely for running so why not have some fun and have shoes that stand out. The bright yellow was an awesome choice! To be frank, I've been partial to the Saucony Ride shoe since I started running but since trying the Mizuno's, I've changed. It's not you Saucony, it's me. I love the feel of the traditional shoe and Mizuno has been able to provide a incredibly comfortable shoes with the feel of a minimal shoe. It's now my "go-to" shoe for distance training. Thank you Mizuno. I'm so happy that you found me otherwise, I might not have ever tried you. I look forward to a long relationship and to every run being a #brilliantrun. For their website, go HERE. To join the Mezamashii Run Project, go HERE. For their Twitter page, go HERE. 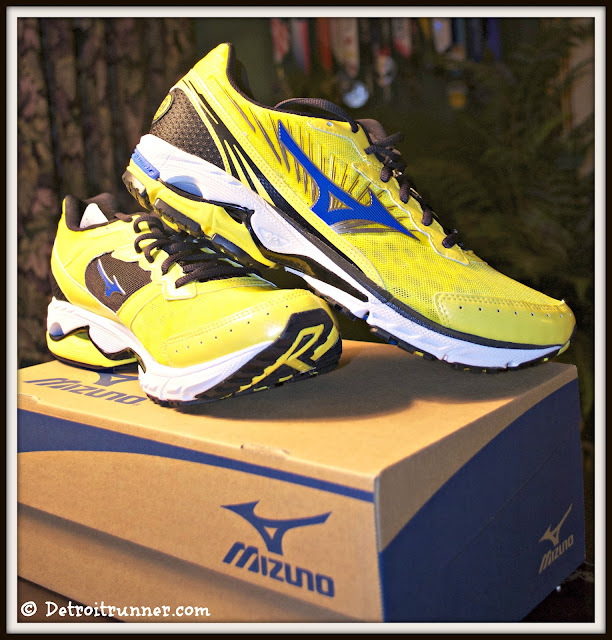 Note - I received a complimentary pair of Mizuno Wave Rider 16's as part of the Mezamashii Run Project. All opinions on this blog post are my own and I was not paid or required to give a particular opinion on the shoes. LOVE the shoes! Great review. Glad you're happy with the product. I work at a running specialty store, so we got to preview the shoes prior to their release. I must say, the new and improved upper is what sold me. I've been a wave rider fan for years, but I think this is the best version yet! Just bought a pair to back up my WR 15s. Cant wait to run in these tomorrow morning. I really love the bright yellow also! Thx for the review.